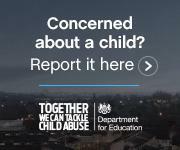 If you wish to report a concern about any other child or young person, click on the image below. You will be taken to the Report a Concern page on the Buckinghamshire Safeguarding Children (BSCB) website. Click HERE for a short video on reporting a safeguarding concern about a child or vulnerable adult.